Coming from a forum held at a hotel in Manila, I took a few photos of scenes along our route back to the university. These are snippets of everyday scenes in the Philippines capital city, which now has for its mayor the former President of the country who was ousted back in 2001 for allegations of plunder. He has been on the news quite frequently as his administration has introduced traffic schemes intended to address traffic congestion in that city. These include going after buses without terminals in Manila last year and quite recently an expanded truck ban that renewed discussions about logistics and the Port of Manila (i.e., decongesting the port in favor of Subic and Batangas ports). Traffic at the intersection of Bonifacio Drive, Roxas Boulevard and Padre Burgos Avenue. The trucks in the photo are coming from the Port of Manila and at the time this was taken, the window of the extended truck ban in Manila allowed these trucks to travel. Barkers meet jeepneys head-on in the middle of the street just past Manila City Hall. A friend posted sometime ago that in Philippine streets, the uneducated dominate the educated and this seems so true in the case of public transport where barkers, paratransit drivers and their lot control how people should get a ride and how vehicles should operate. Organized mayhem – pedicabs run along most of Manila’s streets with many even traveling counter-flow. This photo was taken just across from the old, decrepit Metropolitan Theater just before the Quezon Bridge towards Quiapo. More pedicabs (also called padyak or trisikad), non-motorized 3-wheelers that notoriously violate traffic rules and regulations as they proliferate in many parts of the city. A sign stating “There’s hope for a new Manila.” with the face of former Philippines President Estrada, who was elected Manila Mayor last year. A modern public transport stop along the eastbound side of Espana Avenue shows a guide map and electronic message board that informs people who was responsible for the project. Another modern bus stop, this time just in front of the University of Sto. Tomas campus, which is along Espana Avenue. 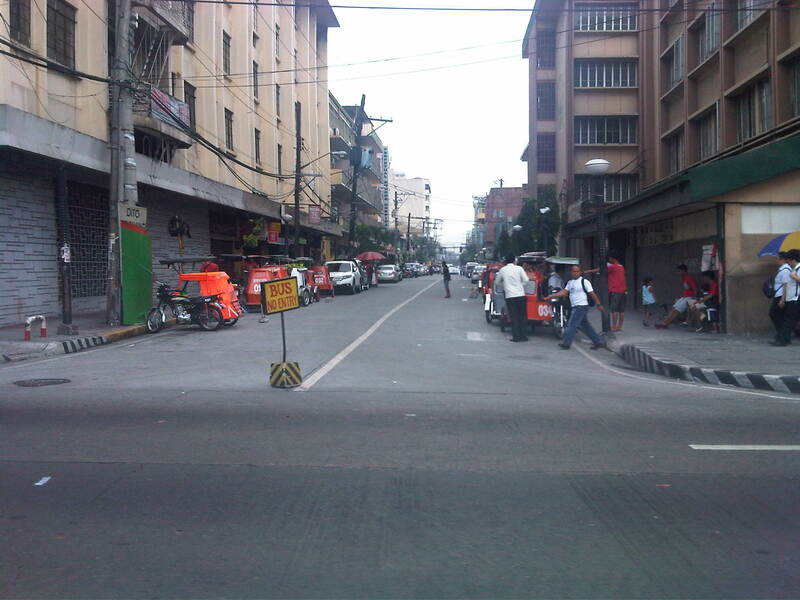 A side street to Espana Avenue reveals an on-street motorized tricycle terminal. There is a sign at the entrance to the street saying buses are not allowed along the road. By d0ctrine in Governance, Highways and Streets, Laws, Logistics, NMT, Pedestrian, Public Transport, Traffic Management on March 21, 2014 .